Is a musical performance “historically informed”? Does it do justice to the “original sound”? Is it even possible to truly experience the “original idea” behind a composition when it is performed with “modern instruments”? We are familiar with questions such as these in connection with the interpretation of so-called early music. On this double album they are rigorously applied to so-called new music. 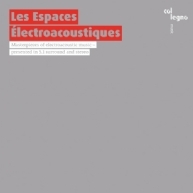 Milestones of electroacoustic music – from Varèse’s Poème électronique (1958) to Ferneyhough’s Mnemosyne (1986) – are investigated from a music-historical perspective and presented in a contemporary 5.1 surround edition. The artistic curiosity, scientific relevance and technical know-how that are essential ingredients for such a project are contributed by the Institute for Computer Music and Sound Technology (ICST) at the Zurich University of the Arts, under the direction of Germán Toro Pérez. The selection of works on this CD mirrors the development of electroacoustic music over a period of 30 years, from the early analogue studios to the shift to digital technology in the 1980s. It includes electronic compositions and works for instruments and electronic sounds using different playback formats. Some of the works are presented here for the first time in surround sound in order to show the relevance of the spatial presentation of works intended for multichannel speaker configurations or complex setups of speakers distributed in space, which stereo sound can only present in a reduced form (for practical reasons, stereo mixes of all tracks have been included on the second layer). The present mixes are intended as transfers to the 5.1 format, offering different listening perspectives as in the concert hall. The Institute for Computer Music and Sound Technology (ICST), a research institute at the Zurich University of the Arts, brings together scientists and artists from various professional backgrounds: mathematics, engineering, psychoacoustics, computer science, generative art, media art, musicology, music theory, performance and composition. This rich mix encourages projects examining the relationship between technology and musical practice using methods of both scientific and artistic research. Listen in on this compilation of selected works from Clemens Gadenstätter’s impressive oeuvre.